It seems as if time is increasingly out of joint. We no longer experience time as a succession or an acceleration of events, but rather as being adrift in a fragmented world of information stimuli, out of the realm of chronology and linearity. What is the impact of this evolution on our perception patterns? How do the different internal, natural, social and technological rhythms relate to each other and influence our daily sensory perception? What is the role and potential of cinema, together with music, the art form most particularly devoted to the shaping force of time? These and other questions will be explored through a series of contemporary and historic film and video works addressing the relation between space, movement, technology and (our experience of) time. There is in the world a great and yet ordinary secret. All of us are part of it, everyone is aware of it, but very few ever think of it. Most of us just accept it and never wonder over it. This secret is time. In his book The Psychology of Time French psychologist Paul Fraisse claims that we are only aware of time when it appears distorted. We have no experience of time as such, according to Fraisse, only of specific sequences and rhythms. It is not time itself but what goes on in time that produces temporal effects. In this sense, Cinema – the sculpting of time – is the medium best fit to penetrate its mysteries. 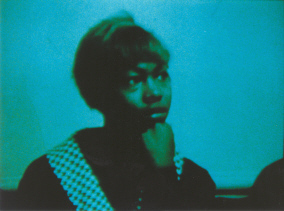 The films and videos in this programme use the plasticity of the moving image and the inherent dialectics between the continuous and the instantaneous in order to explore the tensions between the time of watching, the image’s own time and the existential dimension of time. A portrait of a deserted fishing village in Northern Norway and a journey through time and space: the four seasons unfold in a continuous camera movement through the village of Børfjord. This 12 minute short film was filmed in 70mm Super Panavision, using a specially developed “nature animation” technique. The result is a magic flight in one single shot, along the remains of a village road. At the same time a whole year passes by at 50.000 times normal speed! It is quite impossible to offer a definitive description of Guy Sherwin’s Short Film Series, since it has no beginning, middle or end. Composed of a series of three minute (100ft.) sections which can be projected in any order, the series is open-ended and ongoing. The ideas of film as a record of life and the camera apparatus as a ‘clock’ which actually marks ‘time’ are present throughout the series. 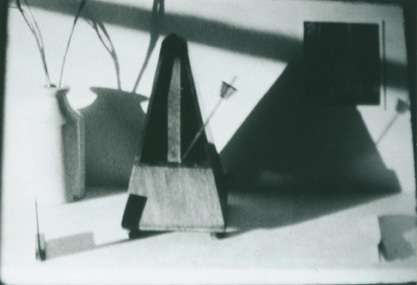 Many parts deal with two rates of time measurement, as in Clock and Candle, or construct visual paradoxes, as in the shuddering stasis of Metronome – an illusion caused by the clash between the spring-wound mechanisms of the Bolex camera and of the metronome itself. In Barn Door the semi-strobe effect of light pulsations flattens the distant landscape. 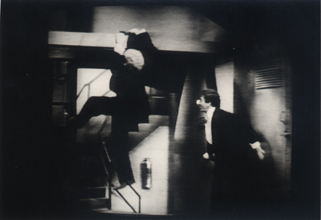 A simple plot: Michael Snow as a “Walking Man”, leaving his office in extreme slow motion. In a single panning shot thirty seconds of real-time action are distended to eighteen minutes by means of a high speed video camera then step printing the video onto film. Filming on video saturates the color, bringing a luxuriant richness to the work, which retains the simple conception of Snow’s earlier films and once again highlights cinematic duration. With See You Later Snow continues his exploration of the ways in which technology enhances our ability to perceive, live in and experience the world. ’The movie projector’s a kind of clock’, Ed Bachelor said. Somewhere inside the machine beats a Piranesi space, shaped and given dimension by a string of exposures of a seated woman undulating gravity-free. 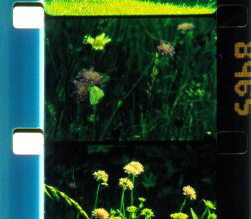 Who is the alluring lady of this filmstrip tease? I call her Dinah, because the name contains a D, an N, and an A. Modern cinema is a reflection of the rationalization and standardisation of time. 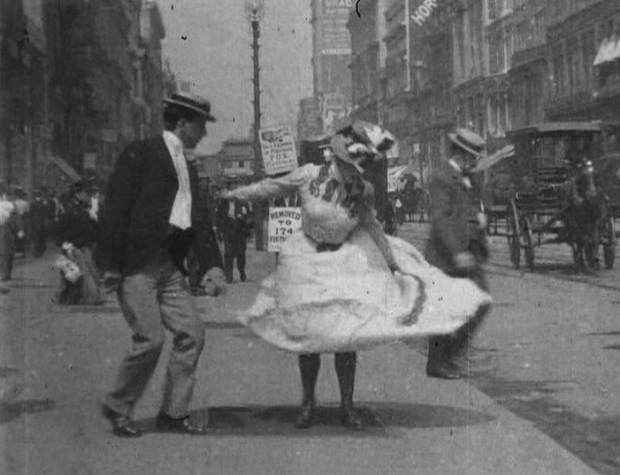 The amazement caused more than a century ago by the possibility of recording and analyzing movement has given way to an obsession with imitating “real time”. The certainties of progress and predictability, the two pillars of capitalist modernity, have also shaped the construction of cinematographic time. 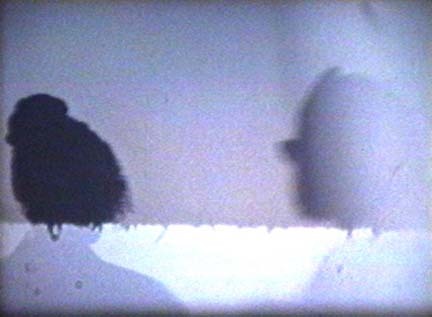 This programme features a selection of works that subvert the mimetic function of audiovisual media, and intervene – via mechanisms of variation and repetition – in the epistemological process of fragmentation that constitutes the basis of the conventional cinematographic vision. Found footage of circuses, fairgrounds and car crashes is repeated, distorted and layered, brought to the point of destruction and then back again, recoalescing to a hypnotic, looping and crescendoing soundtrack. 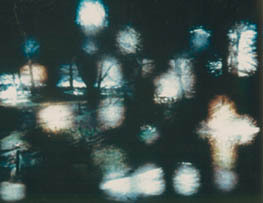 Frequently employing an optical printer for his projects, Worden’s investigations involve subtle explorations of light, texture, colour, exposure, detail, and the other physical qualities of celluloid, emulsion, and the light that must pass through it. 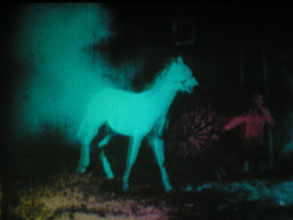 In Throbs unusually beautiful clashes of colour and shape occur a result of Worden’s creative manipulation of time and use of superimpositions. “This film is largely filmed with an exploration of the film medium in certain aspects. 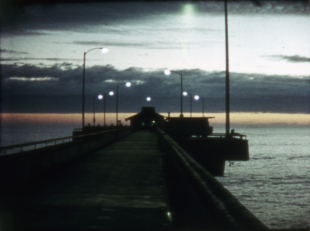 It is also concerned with making certain conceptions about time in a more illusory way than I have been inclined to explore in many other of my films. It attempts to deal with some of the paradoxes of the relationships of the “real” time which exists when the film was being shot, with the “real” time which exists when the film is being screened, and how this can be modulated by technical manipulation of the images and sequences. The film is in two parts joined by a central superimposition of the material from both parts.” (MLG) The soundtrack was supplied by Brian Eno who at the time was exploring, in sound, a similar use of loops that changed their phase shift. 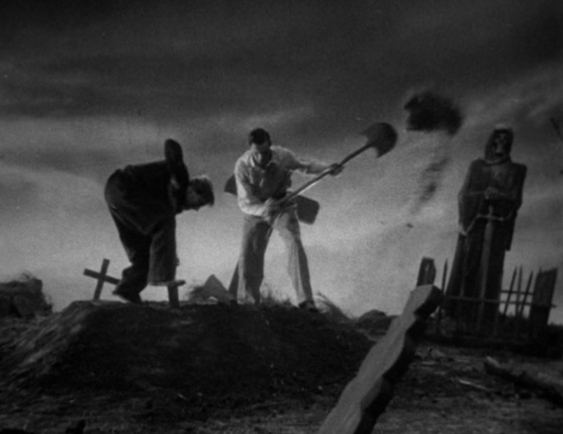 Filmed before Arrebato, Zulueta’s Frank Stein is a very personal reading of horror cult classic Frankenstein (James Whale, 1931), filmed directly from its television broadcast and reducing Whale’s original to only three packed and dizzying minutes, during which the intimate monster evolves at an unusual rate. 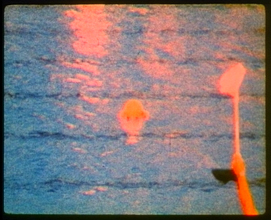 A game of rhythm and tempo which Zulueta will continue to explore in a series of super 8 short films such as King Kong, Mi ego está en babia, A malgam A and El mensaje es facial. Out of fifty feet of footage from a girlie 1950s movie (Apple Knockers and the Coke, featuring Arline Hunter, an actress who clearly attempts to impersonate Monroe), Conner has conjured an allegory of the human cycle of birth and death. He breaks up the tenuous continuity of the original production by reordering poses and distending certain movements via looped repetition or a form of progressive looping in which one movement begins in one shot, is incrementally advanced in the next shot, and so on. Five individual sequences are build around a lush recording of ‘I’m through with Love’; each successive permutation displays pieces of previously unseen footage interrupted by passages of black leader. Conner’s intent, in his own words, “was to take some parts of the found footage and rearrange them to see if the quintessential ‘Marilyn’ could emerge”. In Water Pulu we see a game of water polo. The cameras keep the ball in the middle of the picture (an effect achieved by multiple exposure, copying and manipulations on the optical bench). It becomes the sun around which the human activities revolve. The first movement from Debussy’s La Mer and the noise of the game, which is mixed with the song of the dolphins, refer to water as the essential element for life. An ingenious system of number symbolism governing the order of images and cuts, and references to the significance of sun and water in culture and art place this film in the context of timeless human self-reflection. 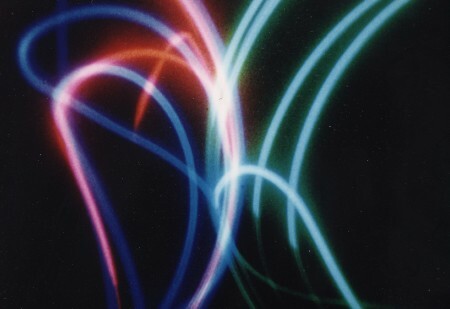 “Galeta hides a true chamber of wonders behind the clear, mathematically abstract structure of his films and videos, meticulously compiled rhythmically frame for frame, each work likewise presenting an analysis of the film medium.” (Georg Schöllhammer). The third part of Pfaffenbichler’s ‘Notes on Film’ series, which borrows its title from a combination of Fernand Leger’s Ballet Mécanique and Peter Kubelka’s Mosaik in Vertrauen. 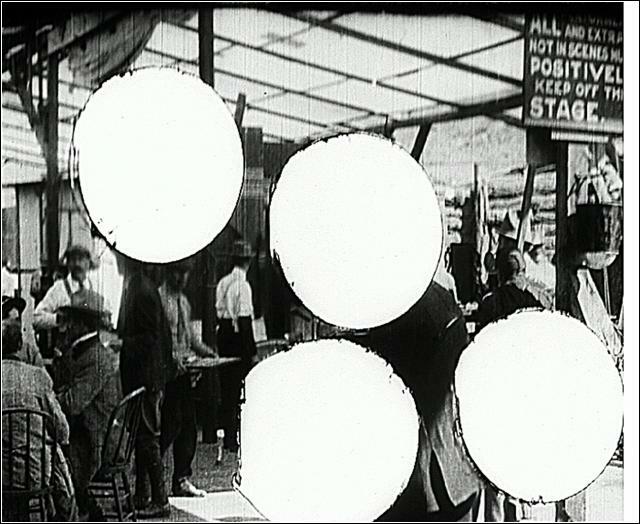 All the shots of the slapstick comedy A Film Johnnie (USA, 1914) are shown simultaneously in a symmetrical grid, one after the other. Each scene, from one cut to the next, from the first to the last frame, is looped. Spatialisation takes the place of temporality, synchronism that of chronology. A polyrhythmic kaleidoscope is produced as a result (reflected in Bernhard Lang’s music), tearing the audience back and forth between an analytic way of seeing rhythmic patterns and the impulse to (re)construct a plot. Take some time, take some more, time is passing, the time of your life, the earth rotates, seasons come and go, the machine sorts zeros from ones, as another thousand tiny bursts of phosphorescent light dance to the rhythm of the wind and the tide. This programme brings together a number of works focusing on landscapes, as meditative time capsules in which different events unfold, activating the potential pasts of a place. 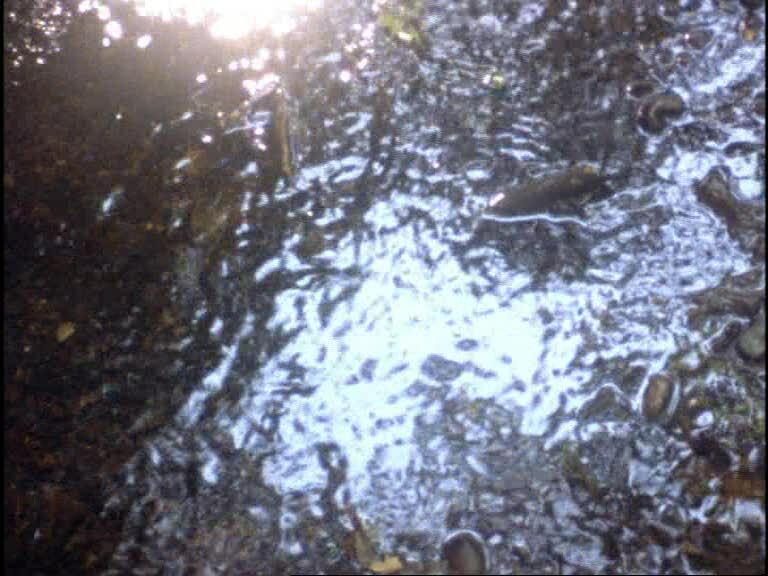 Whereas the landscapes of narrative cinema are often latent expressionistic theatres, echoing the minds of the human figures within them, these films fully focus the attention on the rhythms of the natural world, from the microscopic to the cosmological. The only signs of human life are the traces of destruction left behind by our urge to move faster across time and space. Virilio argues: “it is no longer God the Father who dies, but the Earth, the Mother of living creatures since the dawn of time. With light and the speed of light, it is the whole of matter that is exterminated”. Cobra Mist explores the relationship between the landscape of Orford Ness in Suffolk and the traces of its unusual military history, particularly the experiments in radar and the extraordinary architecture of the Atomic Weapons Research Establishment. 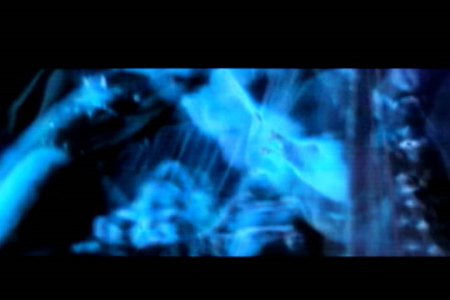 The place has a sinister atmosphere, which the architecture itself begins to reveal and the sense of foreboding is accentuated via the film’s soundtrack by Benedict Drew. 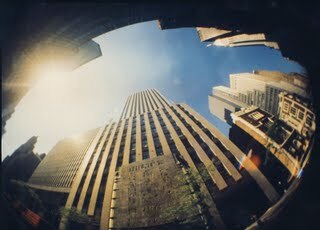 “The film cuts between stillness and activity through time-lapse, a sweeping camera and changing light. The sound also cuts between birdsong and industrial noises suggesting activity when onscreen there is non.” (William Fowler). “Seven years of celestial field recordings gathered from the chaos of the cosmos and inscribed onto 16mm film from various locations upon this turning tripod Earth. This work is neither a metaphor nor a symbol, but is feeling towards a fact in the midst of perception, which time flows through. Natural VLF radio recordings of the magnetosphere in action allow the universe to speak for itself. The Sublime is Now. Amor Fati!”. (JL) Soundtrack by Peggy Ahwesh, with recordings by Ahwesh, Liotta, Mailie Colbert, Barbara Ess and Radio Guitar. With the fantastic illustration of the dromosphere of the speed of light in a vacuum, we are at least to question the witnesses, those of Chernobyl, for instance, for in 1986 the time of the accident suddenly became for them, and finally for all of us, the ‘accident in time’. Chernobyl has irremediably infected our perception of time. A few seconds: that’s all it took to lose control of the reactor. 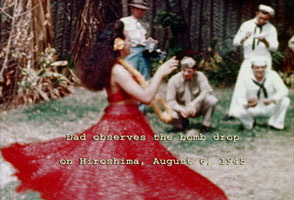 There wasn’t any more time for those who were exposed to a fatal dose of radioactivity. The explosion was only visible for a moment, but seemed to last for an eternity. In only a few days the radioactive cloud flew all over the world, infecting a great number of people. But it will take several millennia until the released radioactive isotopes are completely neutralised. This selection considers the rise of the nuclear threat after 1945 and the application of the technological principles of mass production to mass destruction. A portrait of life in the Arkhangelsk area near the Arctic Circle in Northern Russia, where the Soviet army carried out tests of the hydrogen bomb in 1961. The local Pomors still live the way they have for centuries; preoccupied with fishing, hunting and growing plants. But the nearby rocket launching site has brought with it a new type of hunt, the hunt for “space garbage” which they sell as scrap iron or to use in housekeeping and farming. Medvedev delivers a striking visual exploration of environmental destruction and the rebirth of a community. Shot on location at White Sands, New Mexico, very near Trinity Site – the location of the first atomic explosion in July 1945 – Atomic Park captures sunbathers and tourists taking in the striking sun: the place is now home to a recreation area as well as a military base for research. 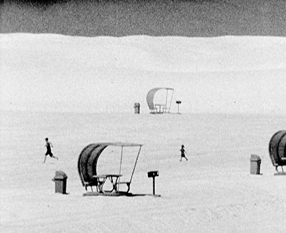 The film presents a national park, a white desert, a natural exhibition space where each presence, each movement can give way to different interpretations and to a new reading of the setting. On the soundtrack we hear faintly the voice of Marilyn Monroe in her desperate and accusatory monologue about manly violence in The Misfits (1961). Partially obscured by a degree of over-exposure, Atomic Park evokes the contradictory experiences of leisure and danger. 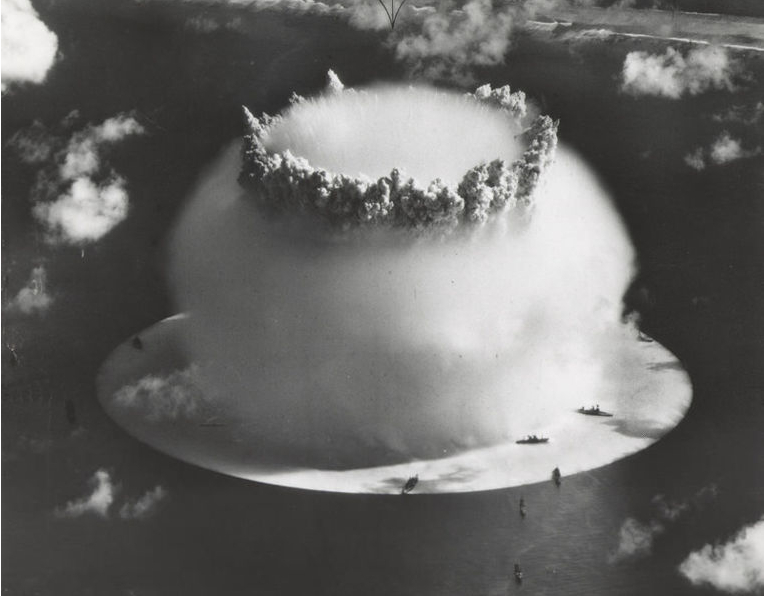 “From material recently declassified by the Defense Department, Conner has constructed a 36-minute work, editing together 27 different takes of the early atomic explosions at Bikini, all un-altered found footage in its original black and white. The film is without dialogue or descriptive factual detail. It consists simply of the visual record of these first bombs’ destructive capability. In his researching, Conner uncovered a vivid historical account of the Bikini tests written for the Joint Task Force (Army and Navy) by W. A. Shurcliff. Interestingly, what one would expect to be a dry, methodical description is in fact dramatic and fascinating, revealing how impossible it was to suppress the bomb’s overwhelming power. This original state of consciousness is what Conner wants us to re-experience in his film. What were the circumstances surrounding these tests, as described by Shurcliff?” (William Moritz & Beverly O’Neill, 1978). Music by Patrick Gleeson and Terry Riley. The city is the place where the forces and fruits of modernity meet: capitalist enterprise, mechanised industrialisation, the movement of anonymous crowds and fast vehicles, kaleidoscopic shopping windows for all tastes and colours. “A city made for speed is made for success” wrote Le Corbusier in 1920. This influential architect saw in speed and urban planning the keys to better living conditions, but failed to take into account the fundamental ambiguities of modern urban living: the simultaneous feeling of agitation and stress, opportunism and nonchalance, order and chaos. 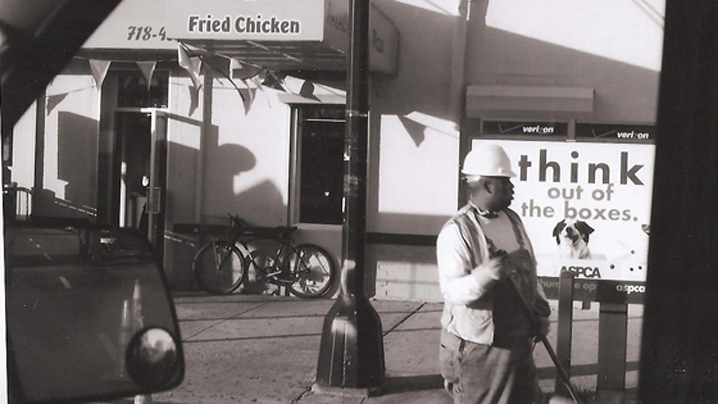 This contradiction appears to be the city’s essence. This is the central idea behind this screenings programme, in which urban surroundings are observed, dissected and transformed into matrices of energy and rhythm, surfaces and patterns, colour and design. Marie Menken, Go! Go! Go! 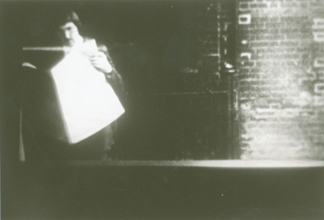 People observed in the street are a frequent subject in Dryden Goodwin’s films, drawings and installations. His video Hold considers the nature of memory, exploring the tension between our desire to hold onto experiences against the inevitability of the passing of time. A recollection of all the people seen through a day, Hold exploits the fact that film is made up of separate frames; it features a new person on practically every frame, or every eighteenth of a second. 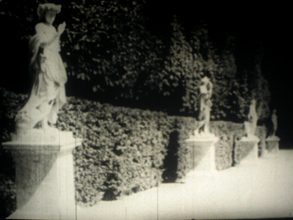 Although occasionally two or three people are held longer, using consecutive frames to jump back and forth between them, the sound and the mechanism of the film are relentless, no resolution is reached, we continue to move forward. A series of scenes shot in the Paris metro, edited to the rhythm of the trains’ automatic doors. The kaleidoscopic effect of viewing through the windows of trains as they pass each other determines the geometry of the image. A composition of parallel and divergent vertical and horizontal movements: those of the camera but also of the trains and the scrolling publicity panels. 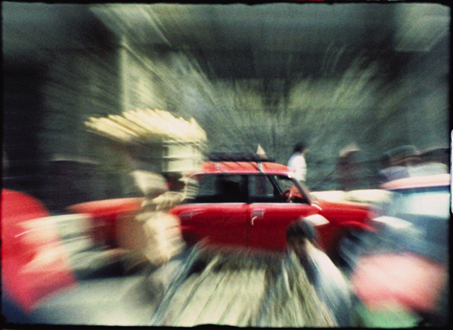 Everyday traffic and urban rush are recurring themes in the work of Michel Pavlou, concerned with the investigation of film’s primary dimension: time. 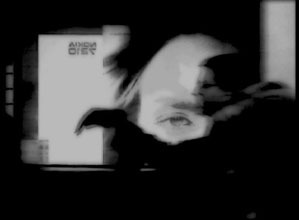 His films and videos move in the interstices of time and space, addressing the tensions between static and dynamic, present and absent, revelation and concealment. 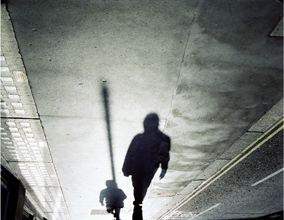 Shadows of pedestrians during morning and evening rush hour at a major urban intersection. 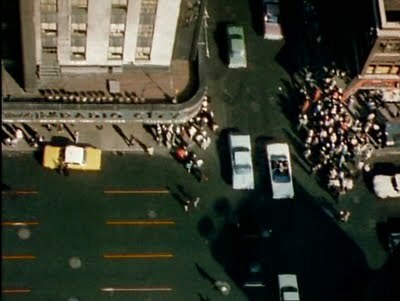 Scenes of people scurrying to and fro, captured from a very different perspective: Only their shadows appear to collide randomly. Everyone is hurrying to work. And subsequently to their homes. 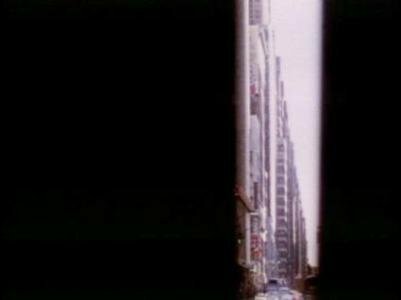 Shot in London’s financial district, Rush Hour, Morning and Evening, Cheapside is an attempt by Canadian filmmaker-artist Mark Lewis to capture the urban fabric. Speed is the form of ecstasy the technical revolution has bestowed on man. (…) When man delegates the faculty of speed to a machine: from then on, his own body is outside the process, and he gives over to a speed that is noncorporeal, nonmaterial, pure speed, speed itself, ecstasy speed. A curious alliance: the cold impersonality of technology with all the flames of ecstasy. Belgian speed racer Camille Jenatzy was the first man to break the 100 km/h barrier in 1899. The car he entered History with was called “La Jamais Contente”. Never satisfied: modernity in a nutshell. The insatiable hunger for machine speed, as the motor for progress, but also as a sensuous experience, is the central theme of this programme. The arrival of trains, cars, airplanes and space shuttles changed irrevocably the relationship between time and space. It increased the speed with which bodies could move across space and dramatically shortened the time involved. But this increase of speed brings along contradictions, paradoxes and dangers…. Accelerating and decelerating rhythms taken from a train as it enters a station. 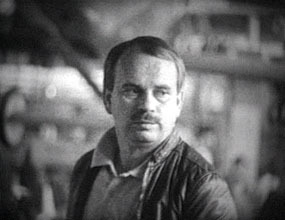 Sound is adapted from Honneger’s orchestral work ‘Pacific 231′. Rallentando is part of Sherwin’s Train Films, which he will present during Impakt in the form of a film performance (see ‘Dopes to Infinity’). 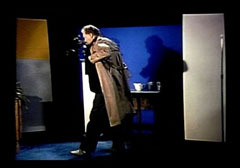 Inspired by the movements and parallax effects of objects appearing to cross each other when viewed from a moving train, as well as by the parallels between film form and train journeys, these films have titles which denote specific musical forms; Canon, Stretto, or instructions; Da Capo, Rallentando. The city of Hong Kong is often seen as a living example of the Virilian notion of ‘speed’. “Change takes place in present-day Hong Kong in ways that do not merely disturb our sense of time but completely upset and reverse it. (…) It suggest[s] a space traversed by different times and speeds”. (Ackbar Abbas). In 1998 Kai Tak airport in the middle of Hong Kong was closed. Approaching Kai Tak was a unique experience for the passengers . 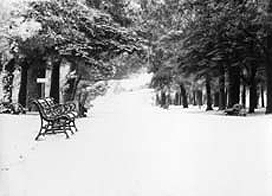 «One could read the newspapers in the street» one passenger exclaimed. 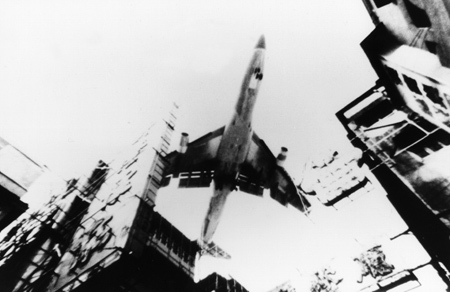 In Hong Kong (HKG) Holthuis films the approach and the passing by of the airplanes in the middle of a city. An observation at the end of this century. Music by David Byrne. Routemaster – Theatre of the Motor is a filmic portrait of speed consisting of strobe-like, fast-flickering shots, and grainy, monochrome images of speeding rally cars. While Pohjola’s Asphalto was still concerned with human interactions, here the absence of humanity is total: what remains are the machines in movement that is an end in itself. 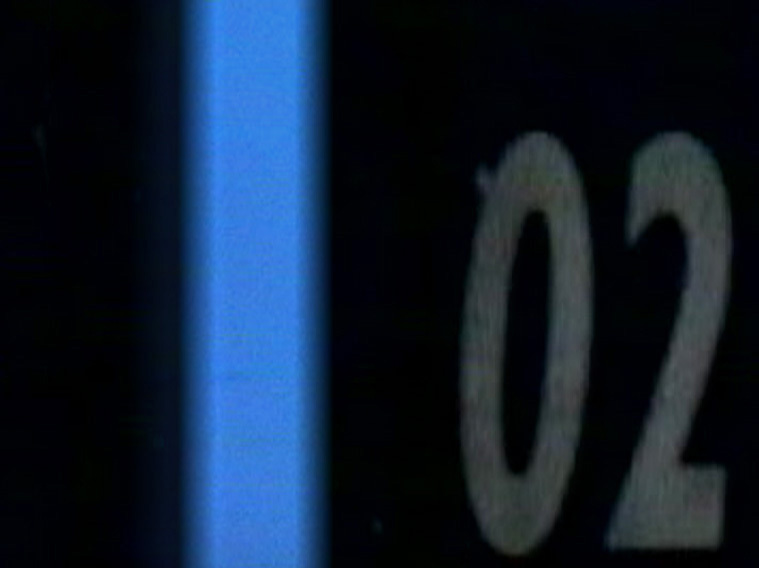 The rhythmic structure is provided by slow-motion, close-up shots of checkered flags, repeated at regular, mathematical intervals, with passing shades of blue providing almost the only colour in the film. At times, the accelerating speed of the images makes it painful to watch the film, like a sort of visual Blitzkrieg waged on the human nervous system through the viewer’s tortured retinas. 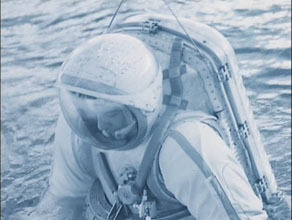 Pelechian’s Our Century is a masterful montage of archive footage of space travel, edited with images from the beginnings of manned flight. A meditation on the space race, the Soviets’ and Americans’ Icarus Dream, the deformed faces of astronauts undergoing acceleration, the imminent catastrophe…. Our century is the century of conquests and genocides, the century of vanity. The absurdity of Man’s totalitarian inclination to colonise and occupy worlds. 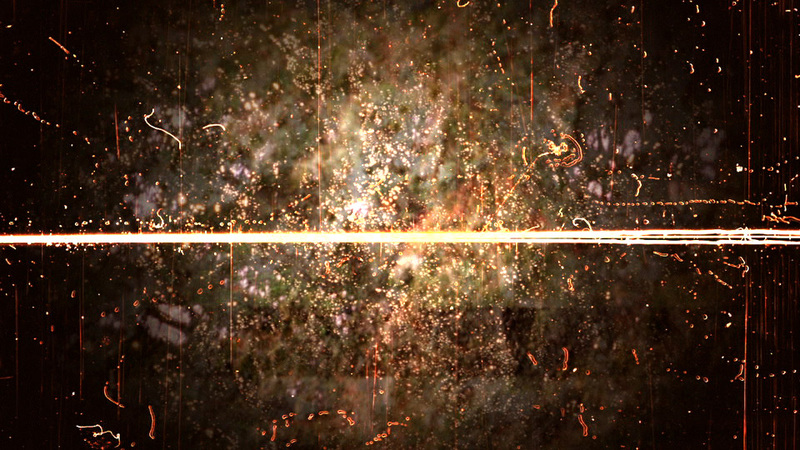 A philosophical film-poem; Pelechian works his images as if they were a musical score. A symphony about humanity, nature and the cosmos. In every whirlwind hides a potential for form, just as in chaos there is a potential cosmos. Let me possess an infinite number of unrealized, potential forms! Let everything vibrate in me with the universal anxiety of the beginning, just awakening from nothingness! Ours is a world in constant flux. Life unfolds in a fog of conscious and unconscious perceptions, a chaos animated by infinite speeds. 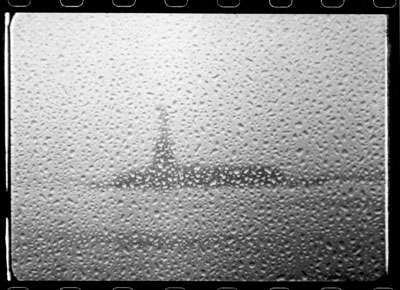 There is no distance, no proximity, no sense of foreground or background. We move through physical and virtual spaces with limbs still nimble – touch, taste and smell intact — but our eyes do not see, they reflect. The world comes to a halt as a pure staccato, a vision without space, without perspective, without context. Gilles Deleuze: “From chaos, Milieus and Rhythms are born. This is the concern of very ancient cosmogonies. Chaos is not without its own directional components, which are its own ecstasies”. Images of the city of Los Angeles, which has been shaped by the history of motorization and where moving perception has come to be regarded as integral to natural perception. 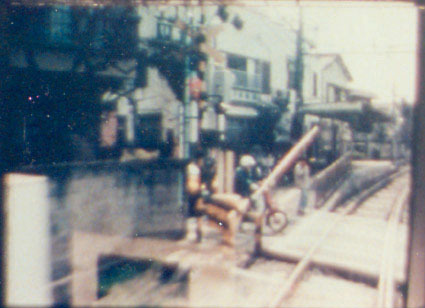 The repetition and temporal reordering of sequences creates a stream of images that can only be read through the speed of the travelling camera. According to Offenhuber, in its fragmentation of the continuum of perception “the subjective geometry which defines space through intervals of time” can remain submerged because it is already so familiar. A work that explores the forms of perception transmitted by technological media. A snapshot taken in a moment of human evolution, where the souls of the living are reflected in the windows of passing trains. The camera captures the reflections of passengers in the train windows as the trains enter and leave the station, and the movement creates a stroboscopic flickering effect that magically exploits the pure sensuality of the moving image. Acceleration reads like a double motion study, examining the movement of its outward subjects (passengers and trains) as well as the camera’s own ability to produce illusions of motion different than those usually generated by the apparatus. “I do not think that the word ‘chaos’ means ‘confusion’ or ‘disarray’, rather I believe it refers to a state in which the name or location of ‘objects’ remains unknown. For instance, if a bird escapes from its cage, the world it discovers outside will appear to be chaos, but if it joins with a flock of other birds, it will gradually learn to apply ‘names’ to various places – a safe place, a dangerous place, etc., thereby creating cosmos (order). When watching a film, the viewers all sit in the same darkness and receive the same light and sound but each sees a different dream. I believe this symbolizes a reversion to their initial state, that when they look at total chaos through newborn eyes, they give birth to a new cosmos. I sincerely hope that the violent chaos that exists in still in cosmos will give rise to the same number of new cosmoses as there are viewers.” (MT). Music by Jim O’Rourke. “Since I was a teenager, I have an epileptic fit. I passed out twice in this year. It is like a memory flashback; wrapped by the various warm childhood images. In this movie, a bisexual boy and a girl are dancing, a kind of love. However; you may not see them though; a strobe light creates you to see the clear images inside of you. (…) All of my film and video pieces are in many ways the abstraction of feeling of people whom have been driven into a corner or stuck in their own maze. Sync Up Element is the cure vision in our data oriented digital lives. I mean I am not making a medicine but film viewing experience itself will open up many discoveries to our natural details in our memories” (SS). 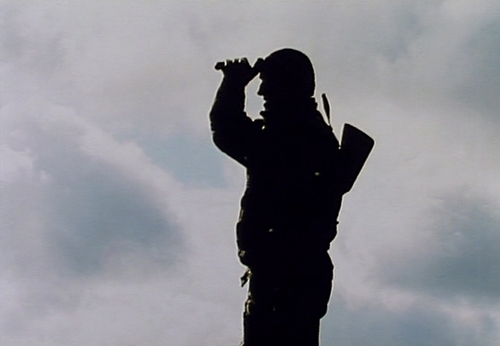 The soundtrack is based on a composition by William Basinski. So many things have changed. But what amazes me the most is: just now it was night, and now it is day and the seasons just fly by. I’d say that is the most impressive thing you see from up here. 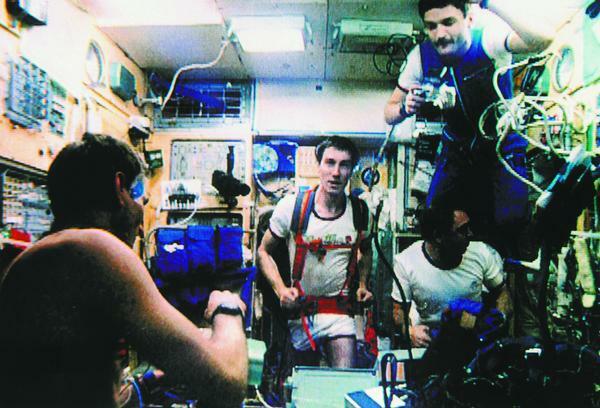 In May 1991 Soviet astronaut Sergei Krikalev left Earth for the space station Mir. 310 days later – 5 months longer than initially foreseen – he returned home, which in the meantime was no longer the Soviet Union but Russia. Krikalev’s experience throws a light not only on the acceleration of history in his country, but also on the acceleration of reality, which according to speed philosopher Paul Virilio leads to the “time accident”. 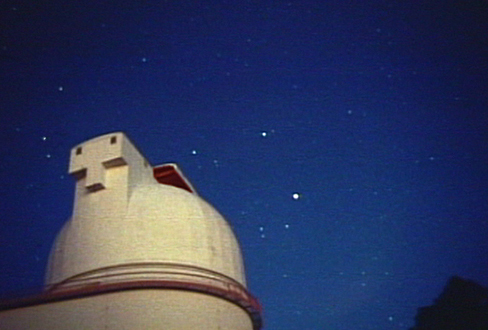 Mir is no longer a monument under the stars but a co(s)mic ruin that symbolises the failure of the progressive myth of mankind’s conquest of the stars.